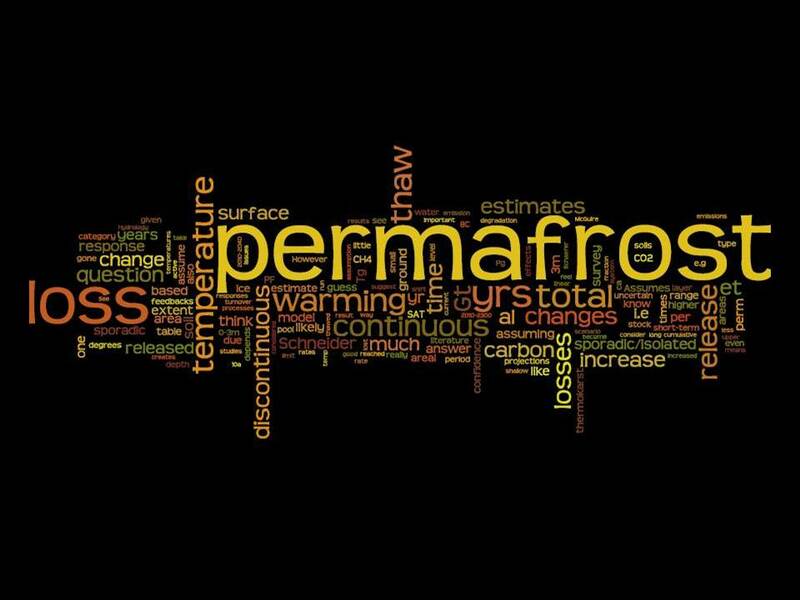 This word cloud was generated from data collected in June of 2011 at the Vulnerability of Permafrost Carbon RCN workshop in Seattle. Workshop participants filled out the permafrost carbon survey estimating the magnitude and timing of permafrost degradation and greenhouse gas release from the permafrost region. Along with quantitative estimates of these fluxes they also filled out a "comments" box for each question where they discussed how they calculated their responses and what assumptions they made. We pooled the comments from all the respondents and generated this visualization using word. The size of each word represents how many times it appeared in the comments section (by Ben Abbott & Jennifer Harden). Update March 2017: Abbott et al. 2016 entitled 'Biomass offsets little or none of permaforst carbon release from soils, streams, and wildife: an expert assessment' has been selected by the editors of Environmental Research Letters for inclusion in the exclusive 'Highlights of 2016' collection. See here for more details. Schuur EAG, Abbott BW, Bowden WB, Brovkin V, Camill P, Canadell JG, Chanton JP, Chapin FS, III, Christensen TR, Ciais P, Crosby BT, Czimczik CI, Grosse G, Harden J, Hayes DJ, Hugelius G, Jastrow JD, Jones JB, Kleinen T, Koven CD, Krinner G, Kuhry P, Lawrence DM, McGuire AD, Natali SM, O’Donnell JA, Ping CL, Riley WJ, Rinke A, Romanovsky VE, Sannel ABK, Schädel C, Schaefer K, Sky J, Subin ZM, Tarnocai C, Turetsky MR, Waldrop MP, Walter Anthony KM, Wickland KP, Wilson CJ, Zimov SA (2013) Expert assessment of vulnerability of permafrost carbon to climate change. Climatic Change, 119, 2. 359-374, doi: 10.1007/s10584-013-0730-7. Download pdf. 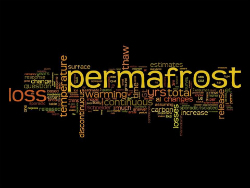 EAGS and BWA designed the permafrost carbon survey along with FSC III, with additional input from Jeremy B. Jones (UAF). The survey used here was modified from an earlier version developed for the Dangerous Climate Change Project (DanCCAP) lead by Mark New and Jasper Sky as a coordinated effort between Oxford University and the Tyndall Centre for Climate Change Research. EAGS and BWA implemented the survey with experts that attended a three-day workshop in June 2011 in Seattle, WA, USA, as part of the Vulnerability of Permafrost Carbon Research Coordination Network (RCN). In addition, three other experts (FSC, PC, SZ) who were unable to attend the workshop but were previously involved in the survey and/or workshop development process, returned surveys. EAGS wrote text with discussion and feedback from all experts. JH, ADM, KPW, JAO and MW (U.S. Geological Survey) participated in the survey but did not contribute to authorship of the Nature Comment, Nicola Jones provided expert editorial assistance throughout the process.